1. Commitment to Excellence: We strive to provide high quality, innovative, accessible, and affordable healthcare that takes a holistic approach to our patients' needs. 2. Compassionate Care: We endeavor to treat our patients with respect and kindness and to provide a comfortable and friendly environment. 3. Continuity of Care: We believe in providing personalized care for our patients and establishing cooperative, working relationships as they grow. We hope that we will form substantial lasting patient/doctor relationships. 4. Education: We seek to actively educate both patients and parents about details of their healthcare, allowing them to play an active role in prevention, understanding, and treatment of pediatric illnesses, conditions, and injuries. 5. Communication: We are open to suggestions and constructive criticism as to how we might improve service to our patients. We believe that through communication we will be able to adapt our practice to best serve the community. 6. Improvement: The physicians and staff at Unifour Pediatrics are dedicated to improving their knowledge base, professional competence, and awareness of recent medical developments. We stress continuing education of our physicians, nurses, and staff to serve these ends. 7. Equal Access: We strive to treat all patients with the same care, concern, and dedication, treating all educational, ethnic, and financial backgrounds equally. 8. Staff Well-Being: We want our employees to truly love their job, look forward to coming to work, want to stay with the team on a long-term basis, and to be well-rounded human beings. We encourage a work environment of cooperation, concern for our fellow staff members, cross-training, fairness, honesty, mutual trust, and professional development. We want our staff to enjoy a full and healthy life with time for their themselves, their families and for their communities. 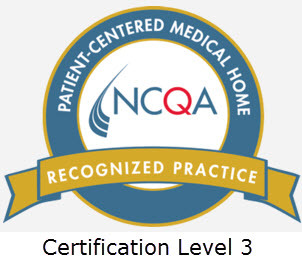 We are now recognized and fully certified as a Patient-Centered Medical Home (PCMH) - Certification Level 3, the highest level currently available through the National Committee for Quality Assurance (NCQA). We are also certified by Blue Cross Blue Shield (BCBS) through the Blue Quality Physician Program (BQPP), which focuses on Primary Care Management and rewards independent practices committed to providing high-quality outcomes, and low-cost, patient-centered care for BCBSNC members. Unifour Pediatrics is also progressing through the Meaningful Use program. Our laboratory is certified by COLA as a moderately complex office medical laboratory. Federal Meaningful Use Certification has also been achieved and consistently maintained. We are honored to be one of 18 pediatric primary-care practices nationwide to be chosen by the National Institute for Children's Health Quality (NICHQ) for the Pediatrics Supporting Parents (PSP) study. 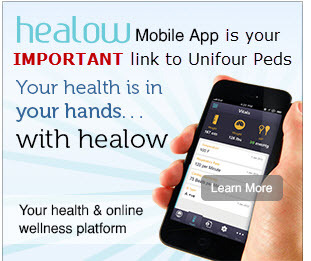 Android) for convenient access specifically to Unifour Pediatrics!